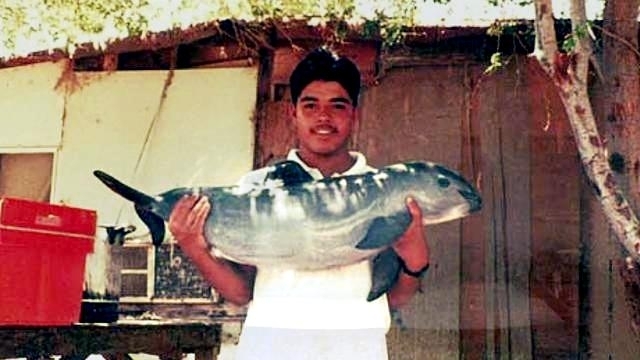 The Vaquita Porpoise is a rare species of cetacean endemic to the northern extreme of the Gulf of California (Sea of Cortez), Mexico. 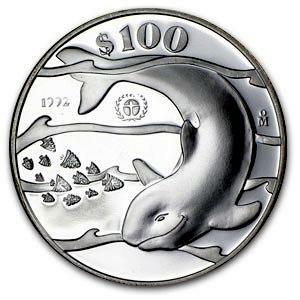 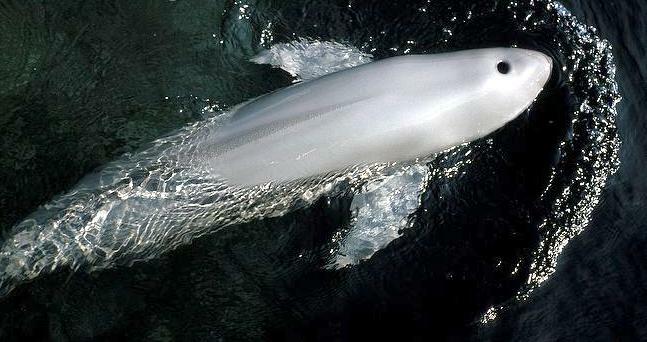 It is the most critically endangered of all cetaceans and also has the most limited distribution. 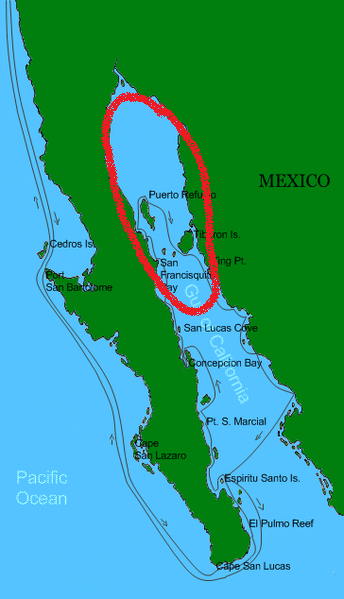 Indeed, the Latin name sinus means ‘pocket’ or ‘bay’, referring to its restricted range. 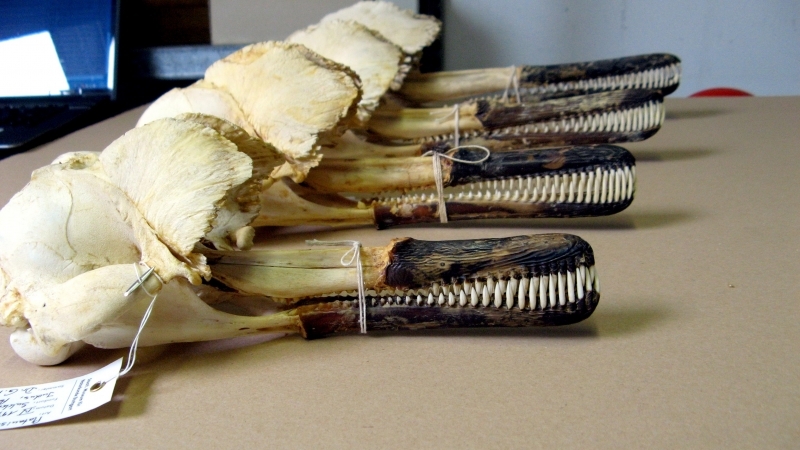 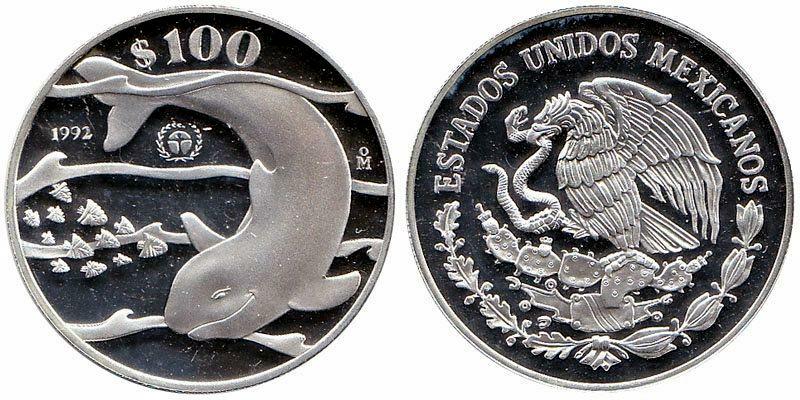 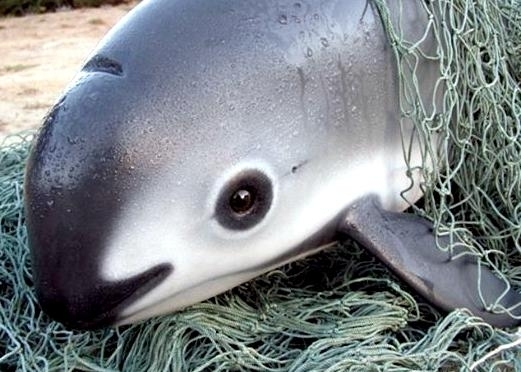 Vaquita meaning “little cow” in Spanish, was only recognized in 1958 on the basis of a few skulls. 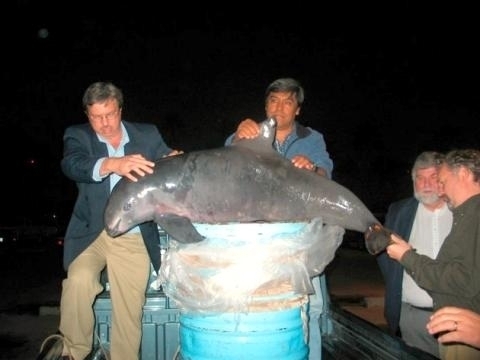 It wasn’t until 1985 when fresh specimens were found and sightings of live animals made, that the Vaquita Porpoise was fully described. 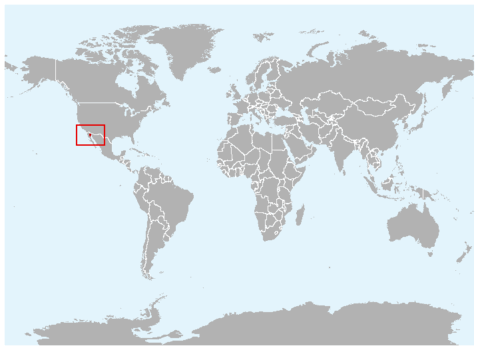 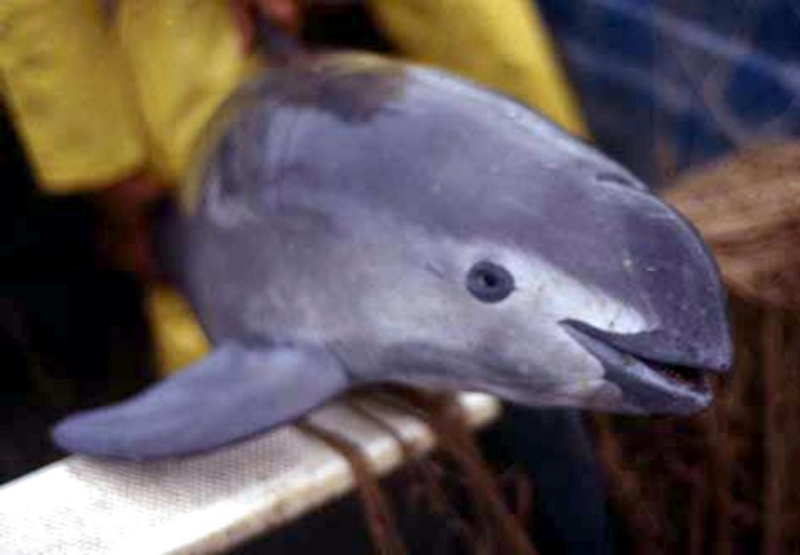 Although geographically closer to the Harbor Porpoise off the coast of central California some 1,500 miles away, the Vaquita Porpoise is more closely related to a Southern Hemisphere species of porpoise. 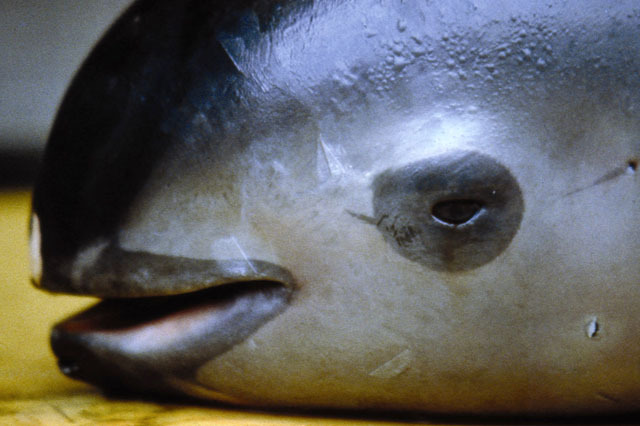 It’s closest cousin, the Burmeister’s Porpoise occurs some 3,000 miles away in Peru and further south. 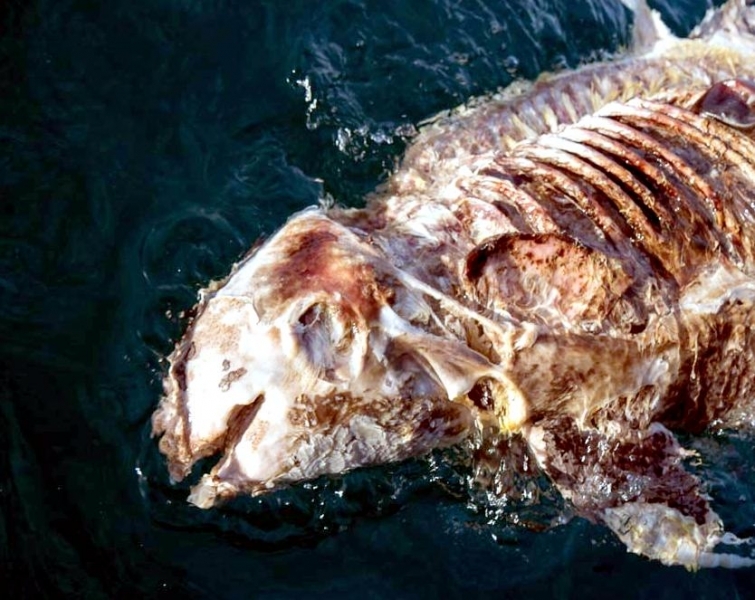 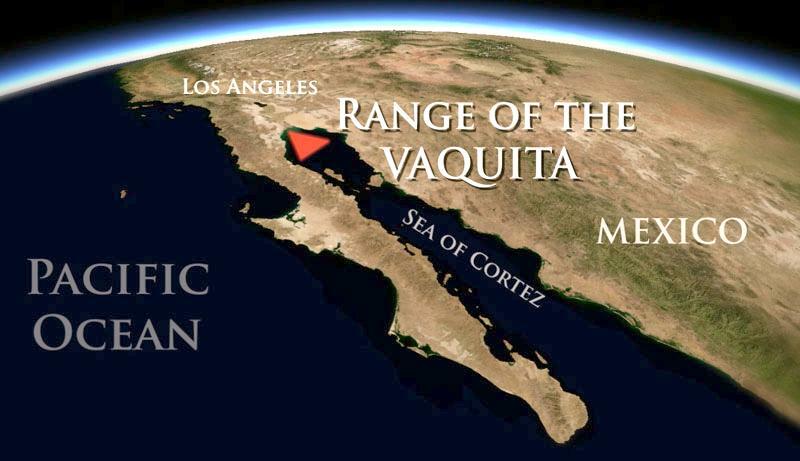 Presumably, the Vaquita evolved from an ancestral population that moved northward into the Gulf of California around one million years ago during the Pleistocene era. 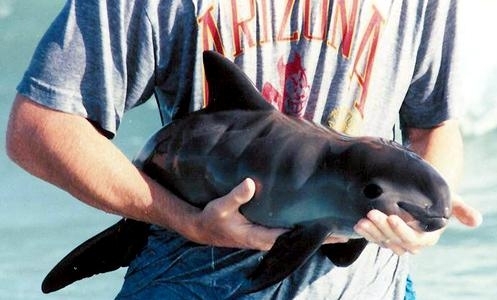 The Vaquita Porpoise is the smallest of all cetaceans. 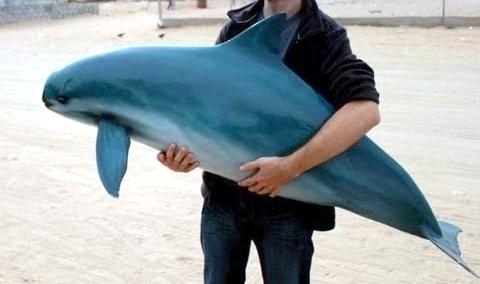 The current known maximum length is 4 foot 11 inches and the weight about 99-110 pounds. 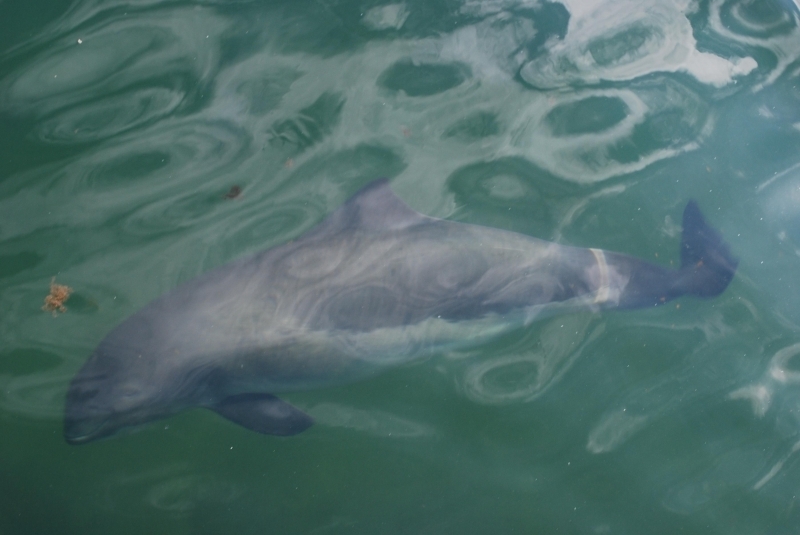 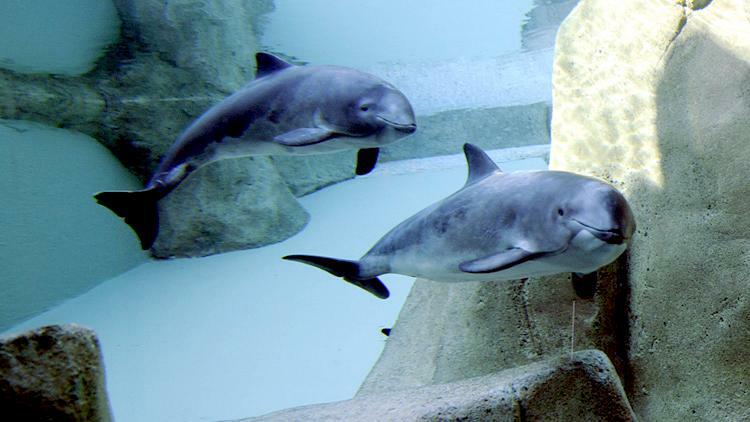 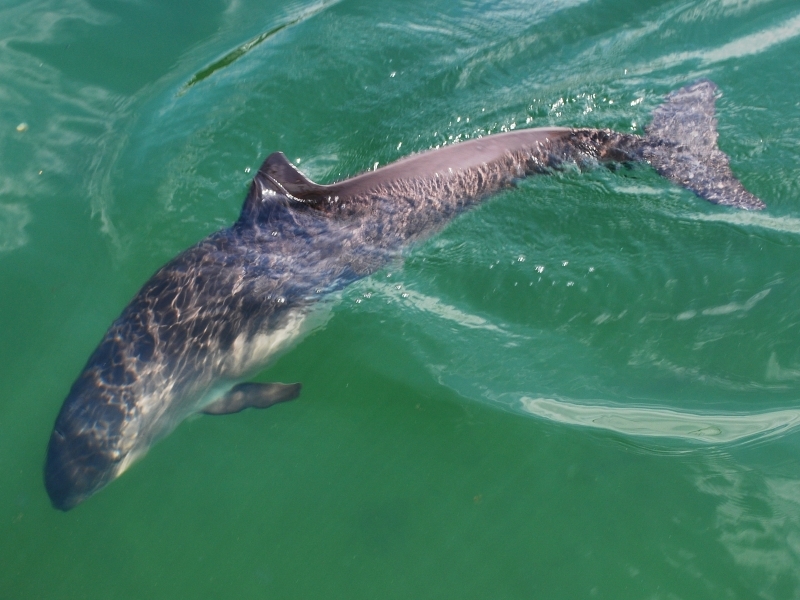 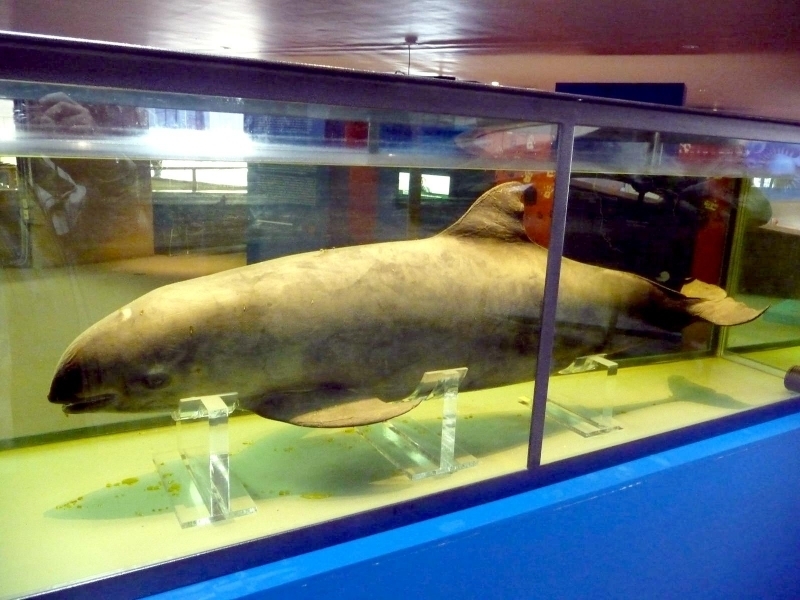 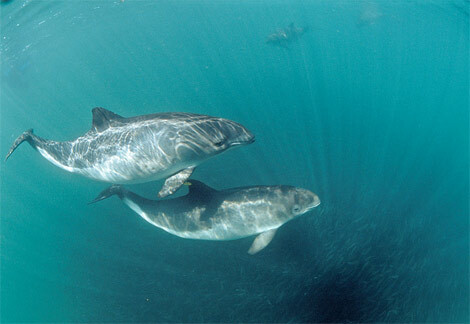 Females are larger than males, as is the case with most species of the porpoise family. 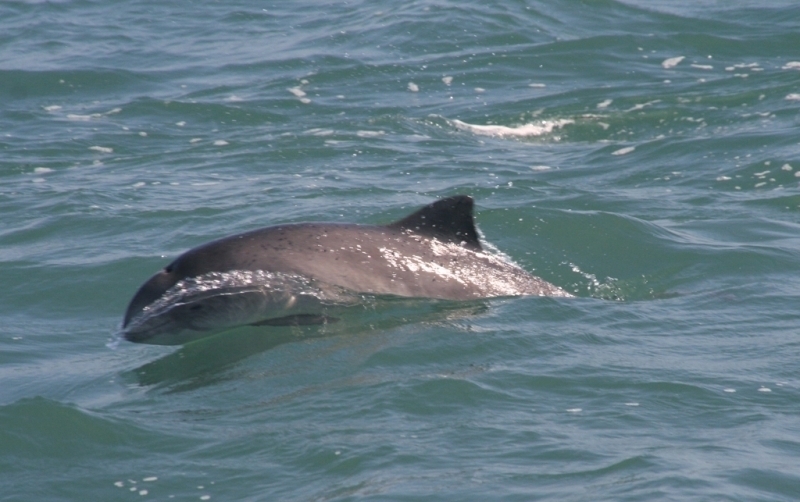 The flippers are proportionately larger than in other phocoenids and the dorsal fin is taller and more falcate. 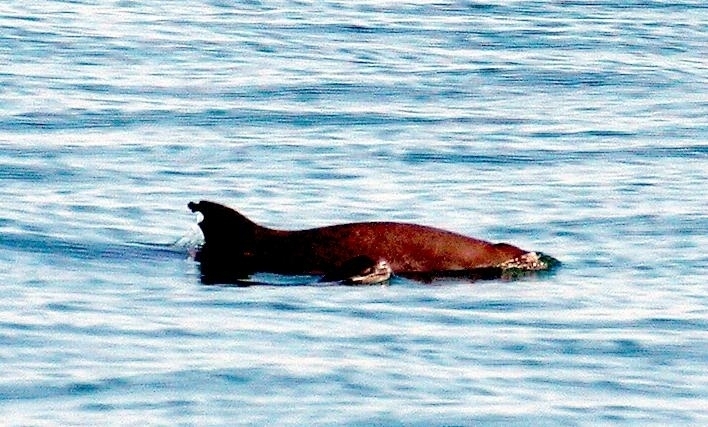 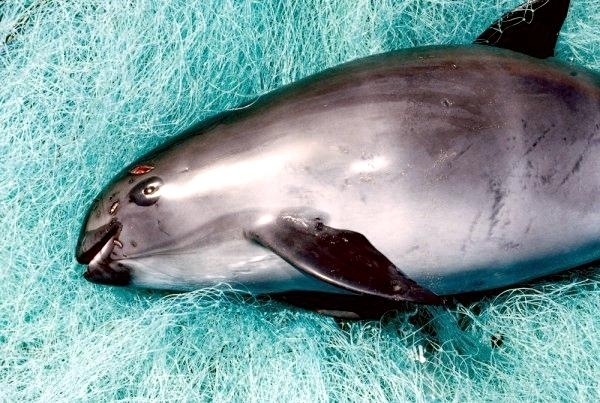 Although it shares the typical stocky body shape of all porpoises with a girth up to 68% of its body length and a blunt beak-less head, the Vaquita’s appearance is quite distinct from the other five porpoise species. 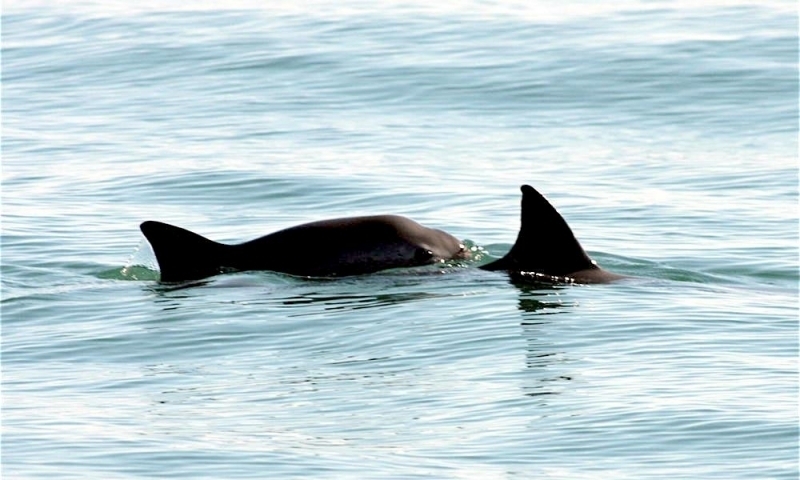 The Vaquita Porpoise has an even, dark gray tone on the back that morphs into a lighter gray on the sides ending in a whitish belly. 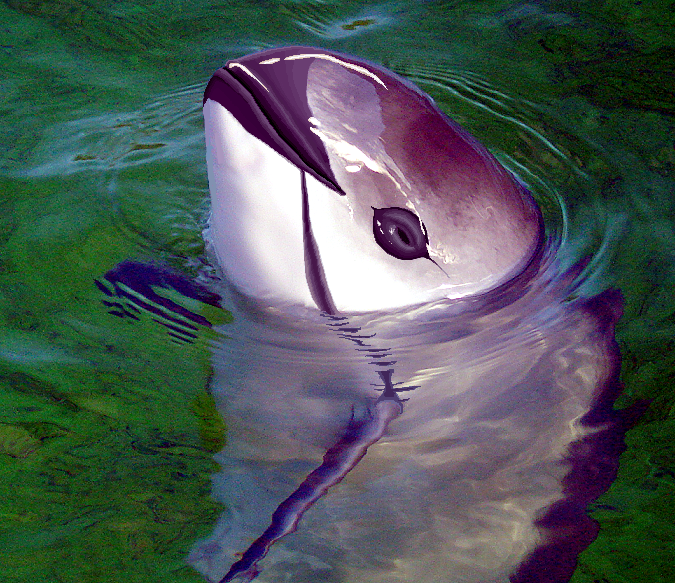 However, by far its most distinguishing feature is its face. 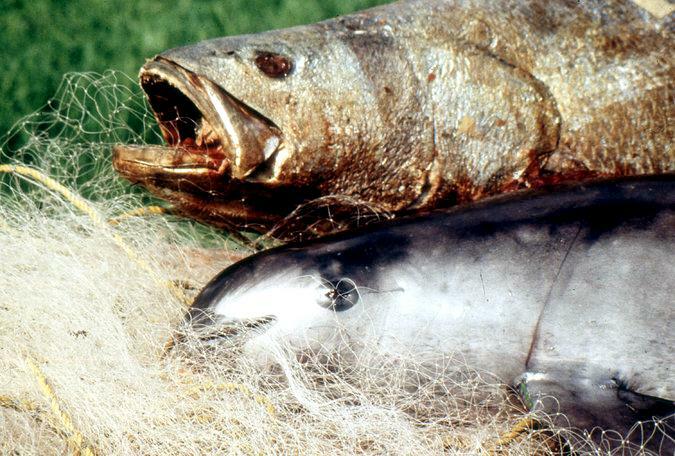 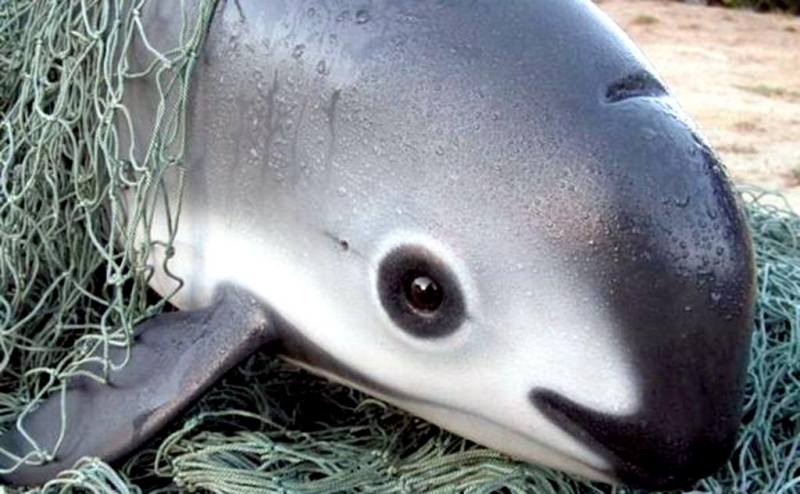 The Vaquita sports a black ring around each eye, a stripe from chin to flipper and a definitive black lipped-smile. 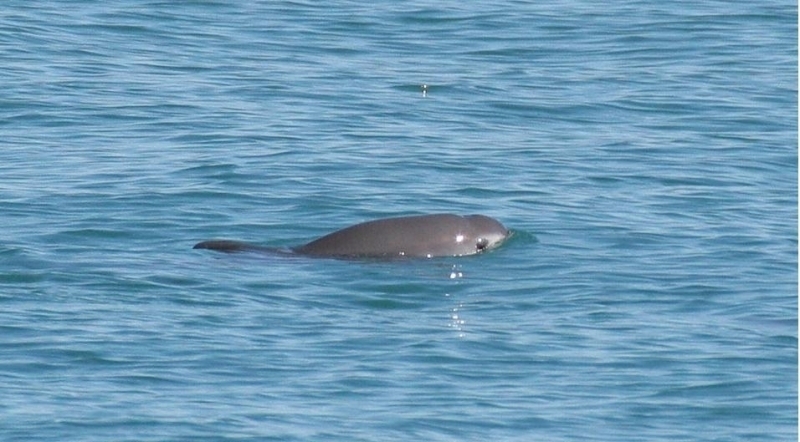 Very little is known about the biology of the Vaquita Porpoise. 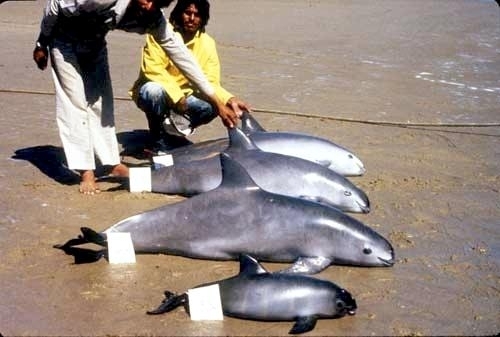 As is usually the case with porpoises, they occur in small groups, most often of 2 to 3 but pods of 8 to 10 have been sighted. 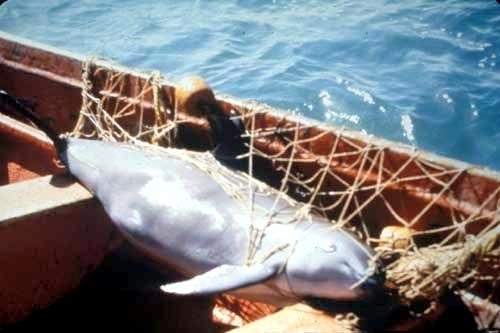 There are relatively few records of the Vaquita in the wild; they are inconspicuous and illusive, compounded by a strong aversion to boats. 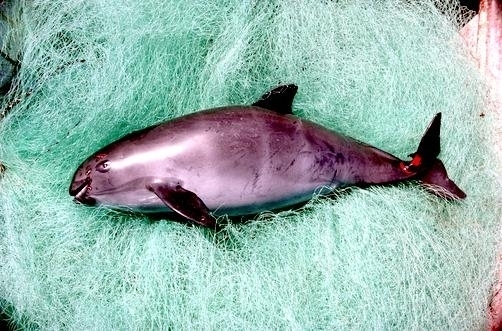 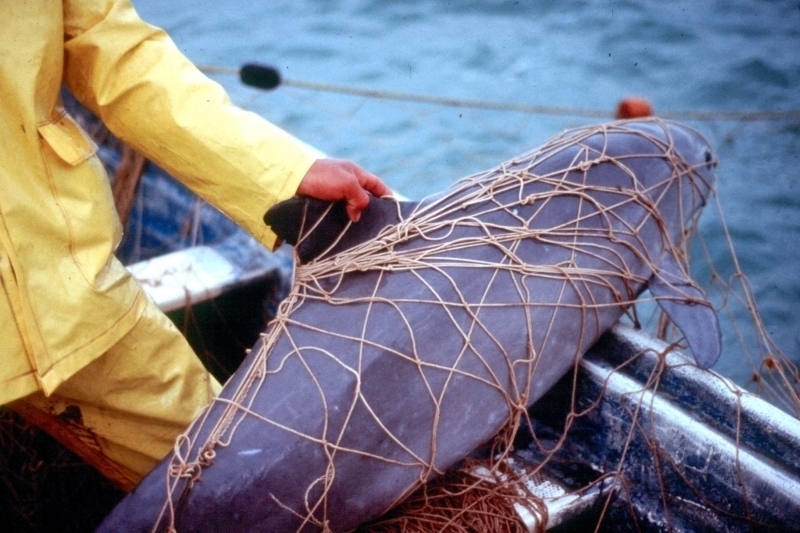 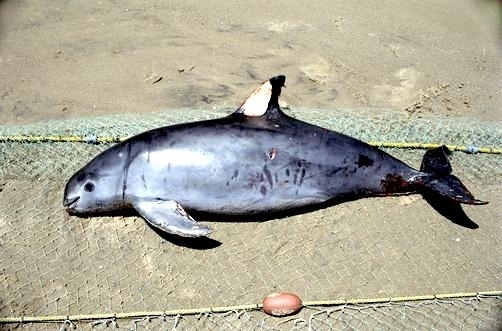 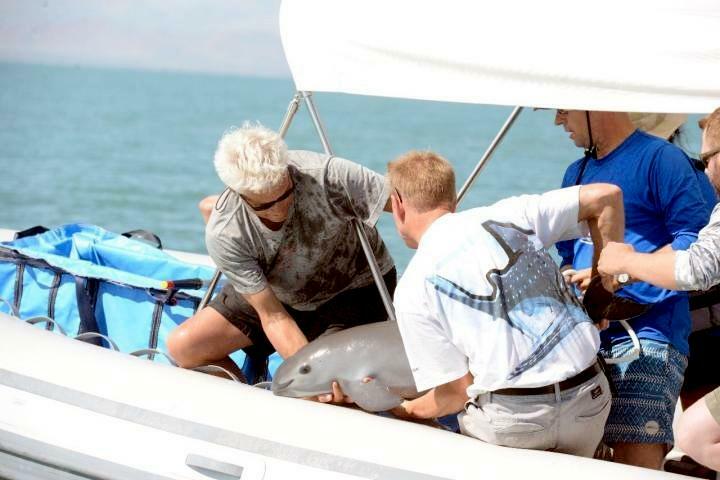 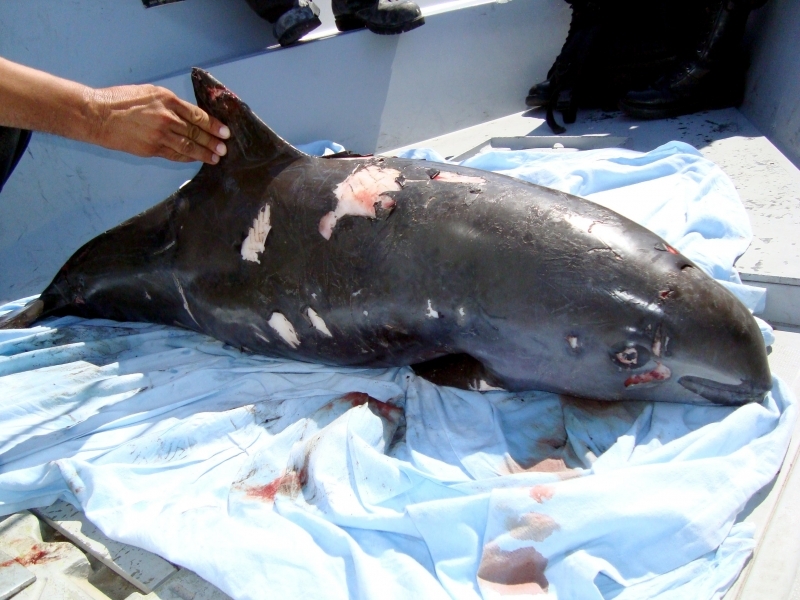 The Vaquita Porpoise does not ride the bow waves of boats, nor are they prone to aerial activity. 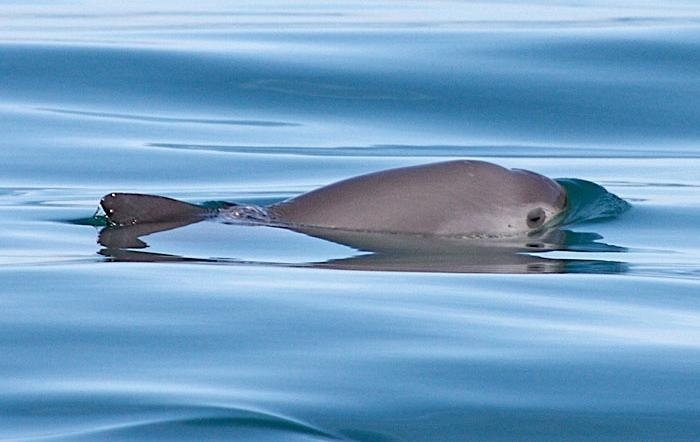 Vaquitas rise to breath with a slow, forward rolling movement that barely disturbs the sea surface before disappearing quickly, often for long periods. 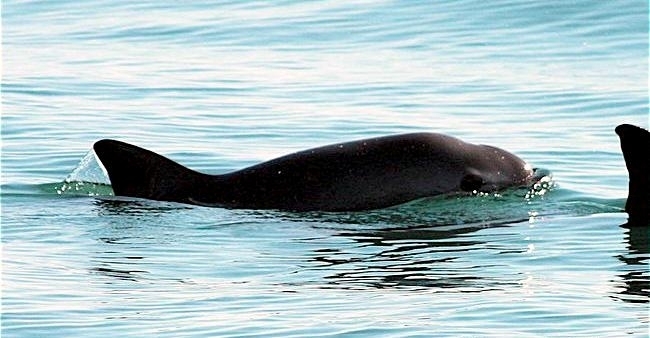 It has an indistinct blow, but makes a loud, sharp, puffing sound reminiscent of the Harbor Porpoise. 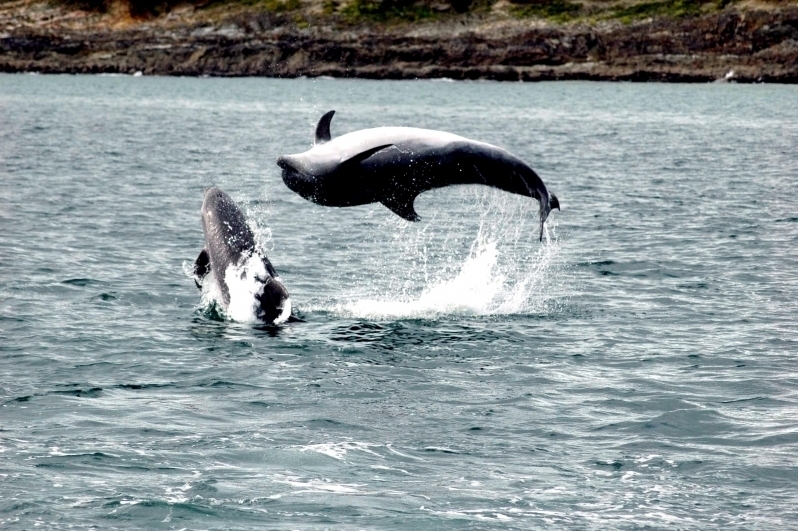 Females reach maturity sometime between 3 and 6 year of age and males appear to be similar. 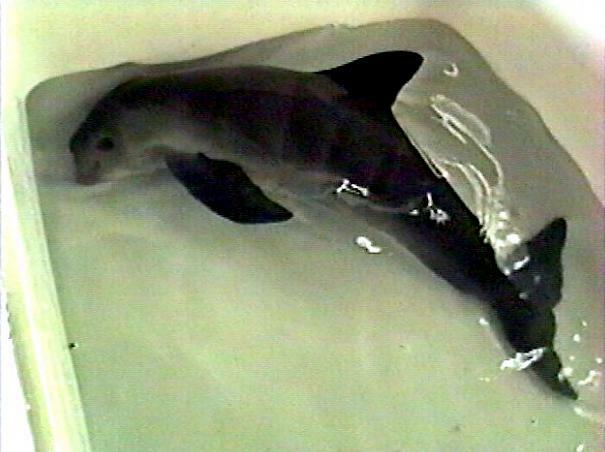 Females give birth perhaps once every two years, with most calves being born in spring after a 10 to 11 month gestation period. 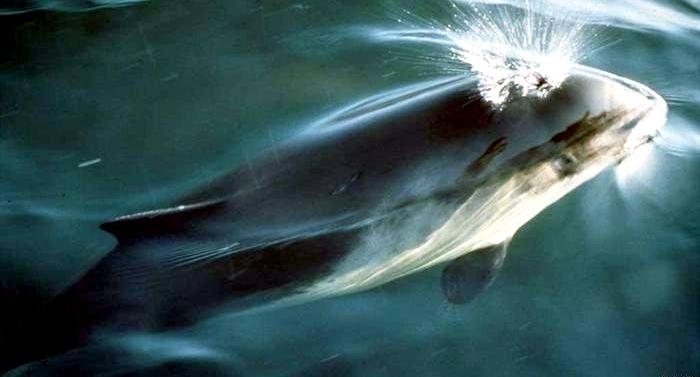 The maximum known lifespan is 21 years. 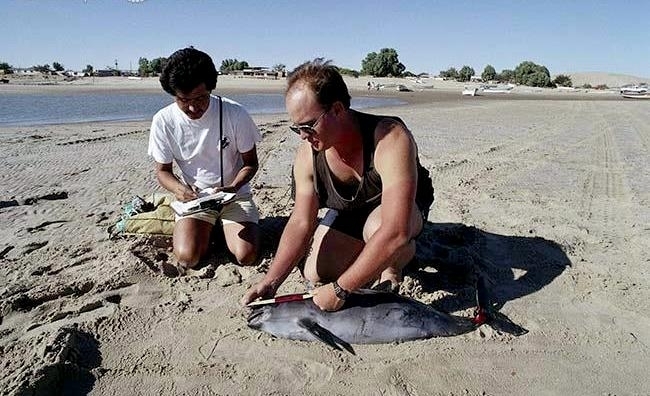 The few stomachs that have been examined indicate the Vaquita preys on a wide range of demersal & benthic fishes, squids and crustaceans. 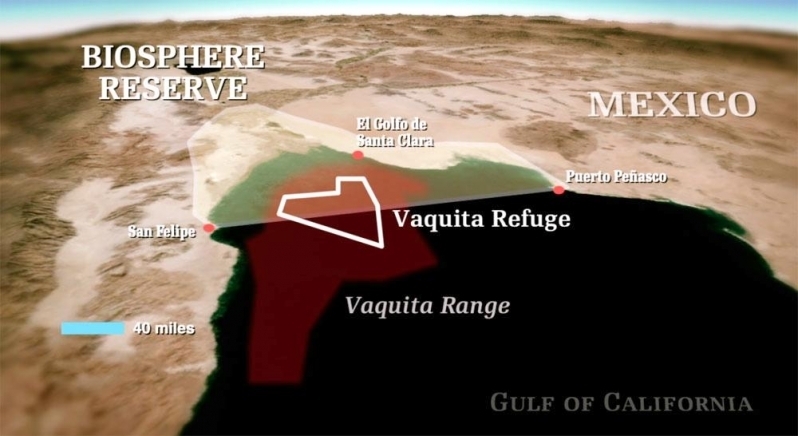 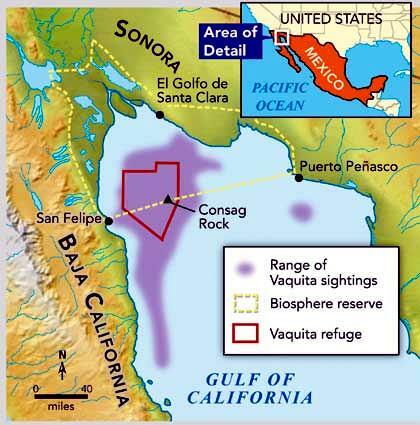 The Vaquita Porpoise is endemic to the relatively murky, shallow waters of the northern Gulf of California, near the estuary of the Colorado River. 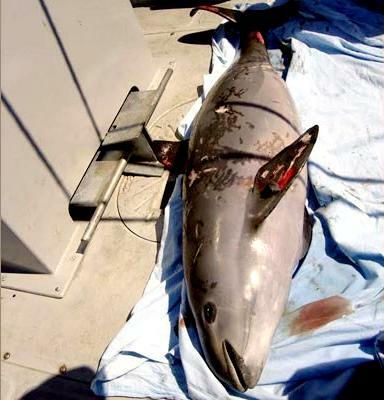 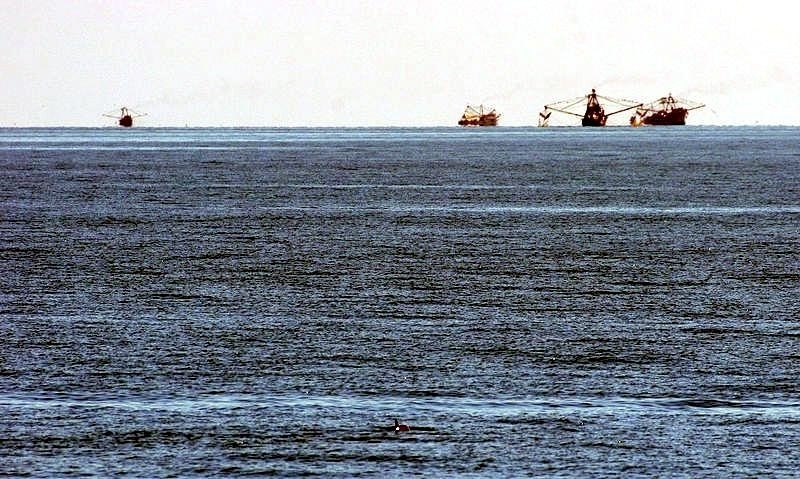 Most sightings have been in water less than 130 foot depth and within about 25 miles of shore. 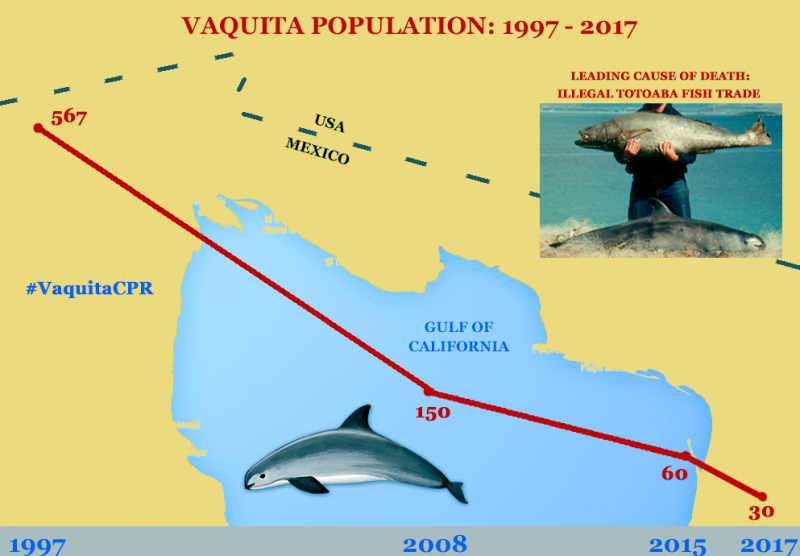 The Vaquita Porpoise is listed as Critically Endangered by the IUCN Red List authority and has received a great deal of attention within the IUCN Cetacean Specialist Group and the International Whaling Commission’s Small Cetacean Subcommittee. 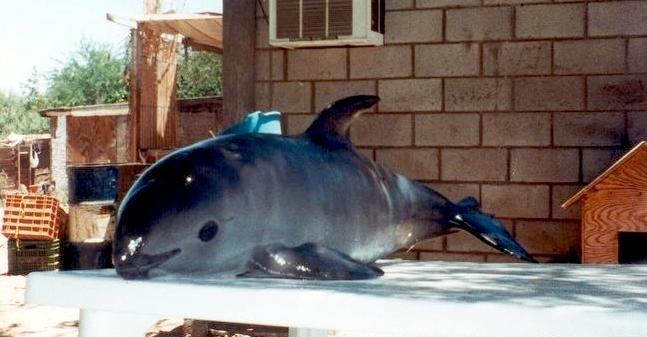 There is widespread acceptance within the marine mammal community of the extremely serious situation that the species is in and for many years, it has been considered the 2nd most endangered cetacean species, after the Baiji of China’s Yangtze River. 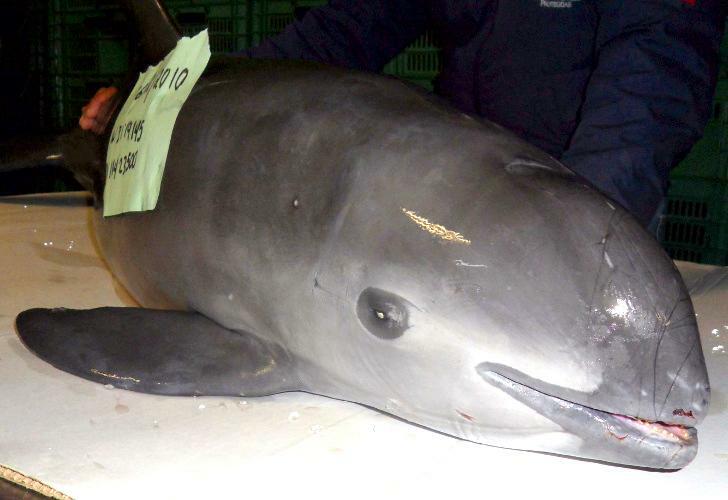 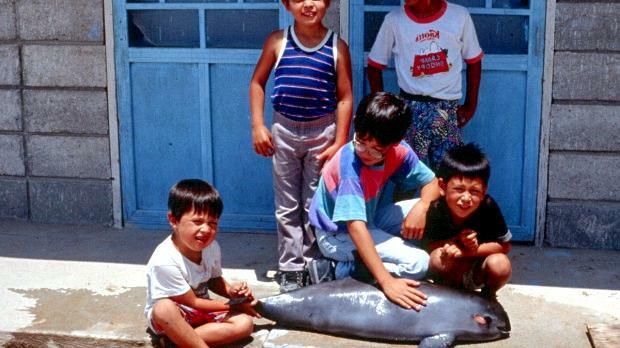 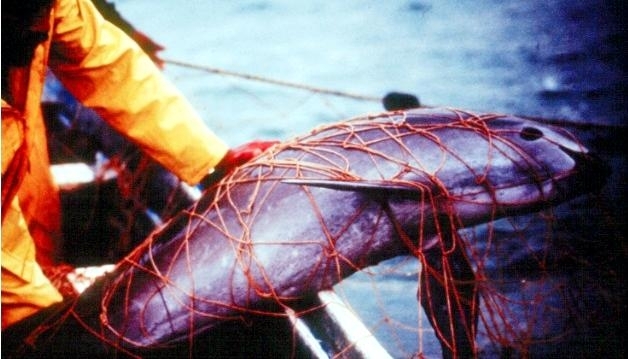 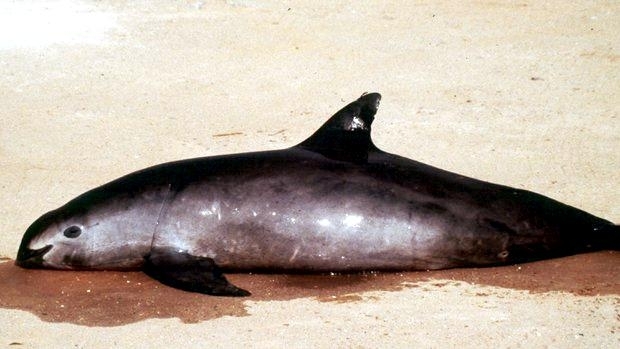 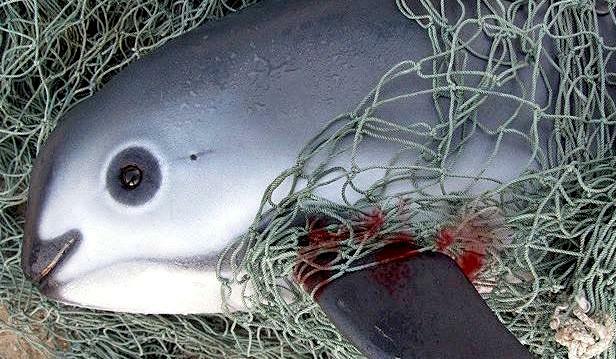 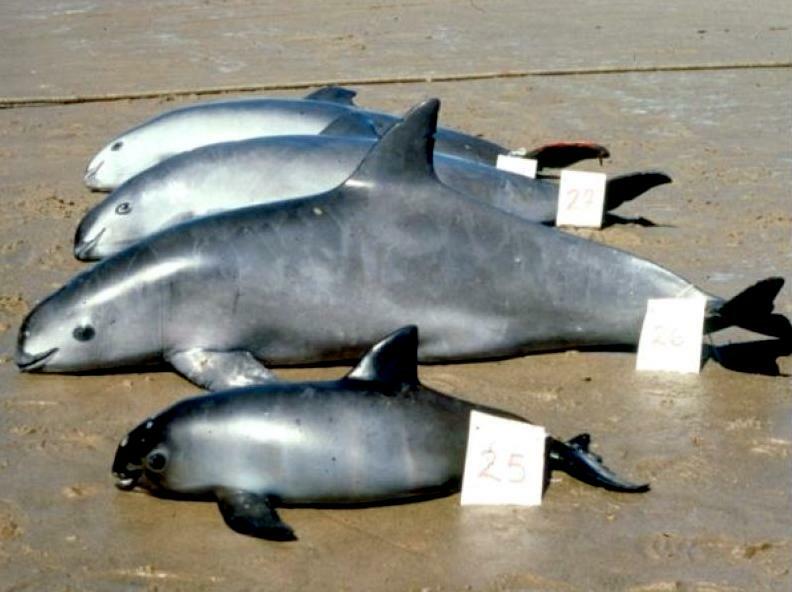 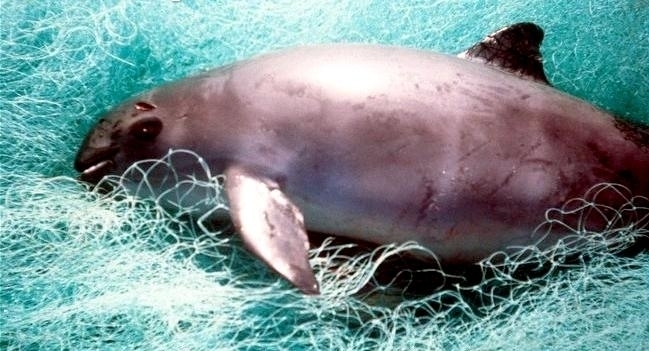 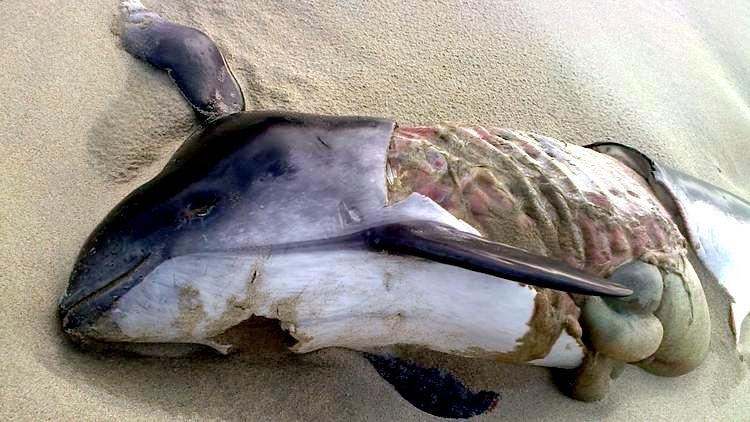 With the recent discovery that the Baiji is functionally extinct, the Vaquita Porpoise is now recognized as the most-endangered cetacean species in the world. 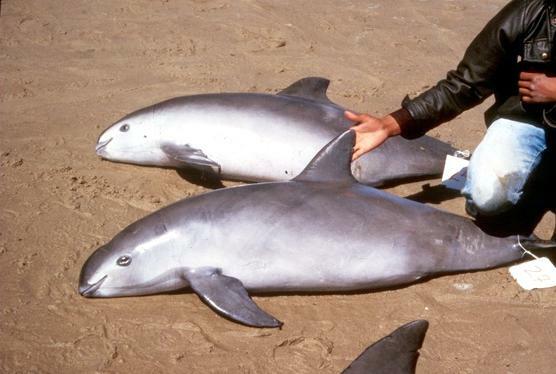 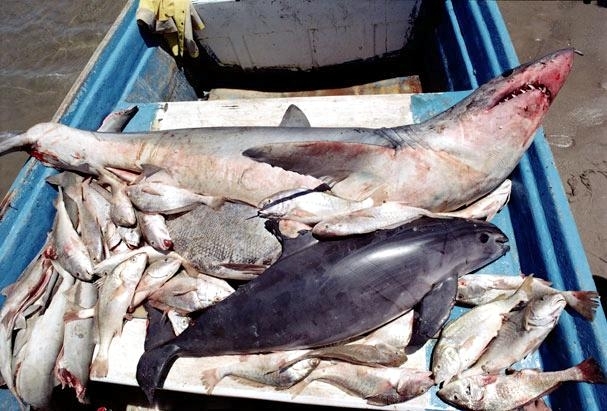 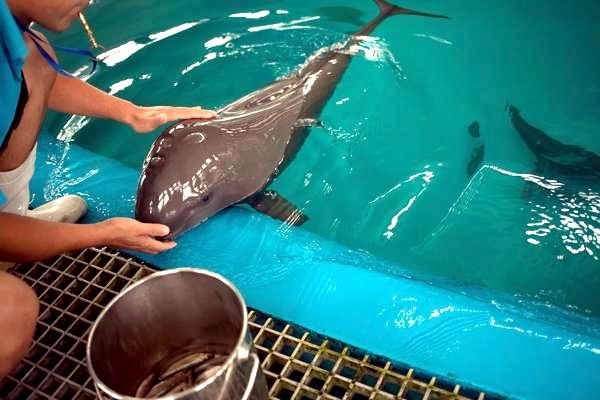 Based on abundance estimated in 1997 of 567 animals and information on life history and recent mortality rates, there are now an estimated number of about 150 Vaquita Porpoises remaining.